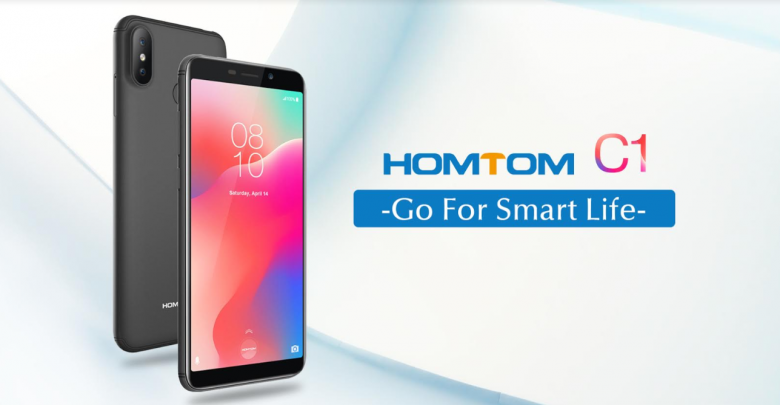 The Homtom company expanded the range of budget smartphones with the Homtom C1 model, one of the features of which was the lite version of the Android OS Oreo – Go Edition). Android Go is a lightweight version of the Android operating system launched by Google targeting low-end smartphones with the OS & apps optimized for low memory and storCage. But telling you you’ll not miss out the chance to grab this phone for only 64.99$. Homtom C1 competes with entry-level smartphones, that’s why it mounts a simple 1GB of RAM and 16GB of ROM, to save all your files on your mobile. In the case of wanting to expand it, you can do it using a micro SD card of up to 128GB. In the case of its hardware, it mounts a MediaTek MT6580 Quad Core which works at a speed of 1.5GHz. With all this, you can use different applications, listen to music or navigate normally. As for its operating system, it has the latest Android 8.1 Oreo in its version Go Edition, that system prepared for terminals with little power to run smoothly. Finally, all this equipment will support hours and hours of use with its 3000mAh battery, ideal for a phone of its technical characteristics and size. Undoubtedly one of the features that most concern users when choosing a new mobile is your camera. This Homtom C1 is presented with a dual rear camera of 13 megapixels (interpolated) so you can do landscape photography, your meetings with friends or any time you alone. 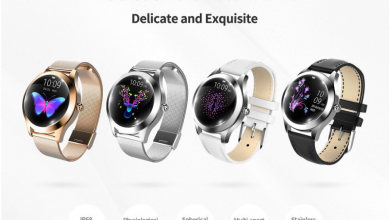 The fact is that you can capture good quality photos, thanks to its Samsung sensor and the LED flash that will help you in those moments where the light is scarce. 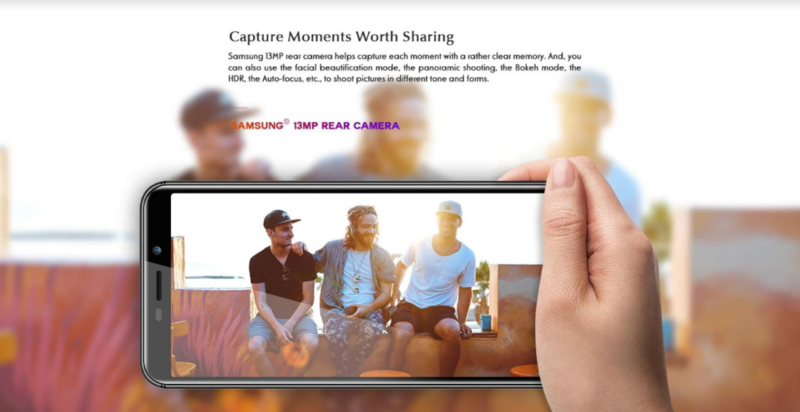 In its front camera, it has 8 megapixels (interpolated) to take selfies and share them on social networks. Bluetooth is in version 4.0 at the start and WLAN b / g / n in the 2.5 GHz band also. The Homtom C1, unfortunately, does not support LTE, but we do not have to do without GPS. Unfortunately, you have to do without wireless charging and NFC. 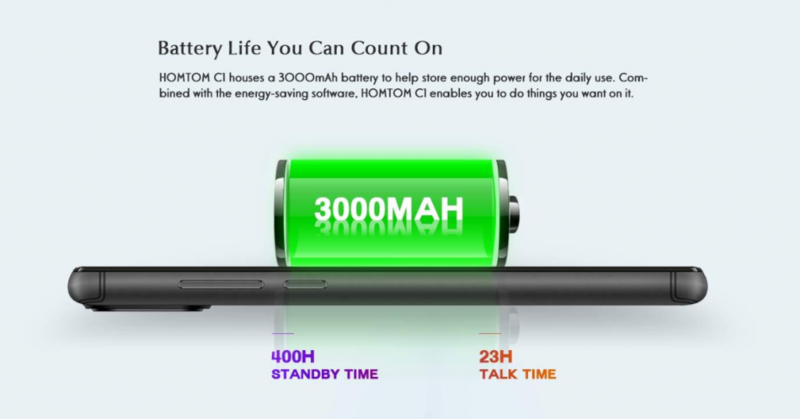 Oh yes, where we are already on the battery: This has a capacity of 3000 mAh and should ensure good battery life, as Homtom relies on power-saving hardware.